The Principles and Model Selection, Application of Bimetallic Expansion Thermometer - SILVER AUTOMATION INSTRUMENTS LTD. The principle of bimetallic expansion thermometer is to apply the principle about thermal dilation, which helps it to work. And it is one kind of solid—expansion type thermometer. The bimetallic expansion thermometer is based on the principle of thermal expansion of solid. To measure the temperature is to use the stitch wielding method to make two metals which have quite different expanding coefficients together in order to have bimetallic temperature—sensing element. When the temperature changes, it will produce the varied expansion and contraction because the two different materials of the bimetals have rather different coefficients of linear expansion, resulting in the bending and deformation of the bimetals. The amount of rotation which is produced by the different amount of deformation will drive the rotating shaft and then the shaft will drive the indicator on the other end. As a result, the indicator can point out the correct reading and the temperature. According to the principle of metallic expansion thermometer, the shapes of temperature—sensing element of it can be divided into the planar spiral type and linear spiral type. The range towards temperature measurement of metallic expansion thermometer varies from -80℃ to 550℃, but the accuracy is not good when it is at the temperature which is extremely low or high. The principle of metallic expansion thermometer decides it has an excellent resistance to shock and it is convenient to reach the readings. And that is why it is suitable for many kinds of industries and equipment. Classifications: on the basis of the connecting direction between the pointer disk of metallic expansion thermometer and protector tube, metallic expansion thermometer can be classified as axial type、radial type、135 degree direction type and universal type. ①Axial typed metallic expansion thermometer: the pointer disk has a vertical connection with protector tube. ②Radial typed metallic expansion thermometer: the pointer disk has a parallel connection with protector tube. ③135 degree direction typed metallic expansion thermometer: the pointer disk has a 135 degree‘s connection with protector tube. ④Universal typed metallic expansion thermometer: the pointer disk can have any angel’s connection with protector tube. 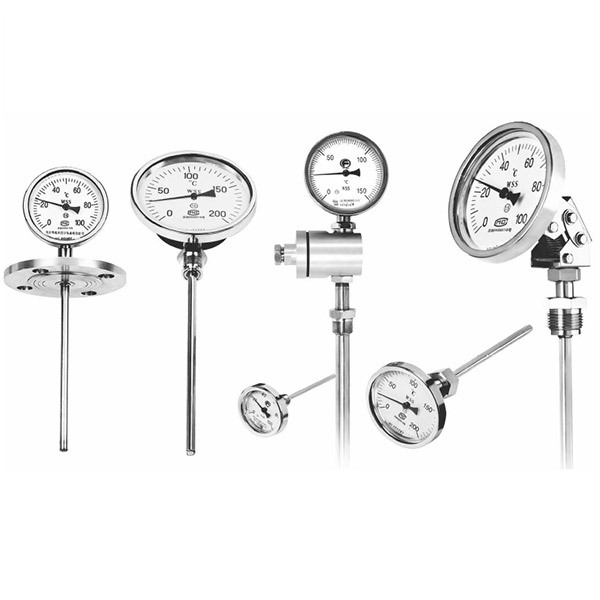 In order to meet the needs of actual production, metallic expansion thermometer has different installing fixed forms: moveable male connector、moveable internal screw pipe、fixed screwed connection、cutting sleeve screwed connection、cutting sleeve flange jointed and fixed flange.